Just twenty miles east of downtown Atlanta, outdoors enthusiasts will find multiple projects for which Stability Engineering has completed the structural engineering, within one of the most unique natural resources in the Southeast. The 40,000-acre Arabia Mountain National Heritage Area (AMNHA) stretches through portions of DeKalb, Rockdale, and Henry counties, encompassing the Davidson-Arabia Nature Preserve as well as Panola Mountain State Park. Visitors can hike or cycle along the 30 miles of dedicated trails, visit the Monastery of the Holy Spirit, or visit the Lyon Farm to see Stability’s projects among the rolling hills, secluded lakes, and the signature stone outcroppings of Arabia and Panola Mountains. At the Monastery of the Holy Spirit in Conyers Georgia (#21 on the map), Stability assisted in the extensive renovation of their 19th century barns and addition of the new Visitor’s Center. In the Big Barn, heavy powder-post beetle damage and water damage were overcome with non-destructive wood testing. Both barns were then reinforced and strengthened and the structures updated with a design that allowed them to retain their antique charm and historical value. The existing structure of the Historic Barn required a custom steel “web” reinforcement. The new Abbey Store, Monastic Center, and cloister all feature custom wood roof trusses and custom storefronts. This project was completed with Cooper Pierce at Jones Pierce Architects. Stability Engineering recently won a Merit Award from the Structural Engineers Association of Georgia for our work on the Historic Barn. The Lyon Farm (#12 on the map) is a historic farmstead along the South River that was occupied by the Lyon family from the early 1800s until about 2006, and is one of the oldest residential structures in DeKalb County. This land was originally part of the Creek nation, then was deeded to Joseph Emmanuel Lyon in an Army Land Warrant in 1790 for services rendered during the Revolutionary War. The Lyon family used the land as a self-sustaining farm to raise cows, hogs, cotton, muscadines, fruit trees, sorghum, and bees. The Arabia Alliance held several archaeological digs to learn more about the people who lived on and worked the farm, and the Flat Rock Archives help to tell the remarkable story of the community that formed along the South River in the early 1800s. Stability Engineering provided an inspection of the home’s interior and exterior structural damage and specified repairs and stabilization to reduce further deterioration, in preparation for later rehabilitation of the farmstead. This project was completed with the Arabia Mountain Heritage Area Alliance. In Panola Mountain State Park, the Rockdale River Trail and the Panola Greenway Trail feature several joint projects completed by Stability Engineering with Greta de Mayo of Kaizen Collaborative for the PATH Foundation. The Rockdale River Trail meanders over 5 miles from Alexander Lake to South Rockdale Community Park, and features a 120-foot curved bridge (see #17 on the map) high over a tributary to the South River. The steel beam bridge bears on concrete abutment walls and mid-span concrete wall bents ranging in height from ten to fifteen feet; the handrail was detailed with weathered steel posts and steel cabling. In addition, further down the trail towards the Monastery, Stability engineered the foundations for a 120-foot long prefabricated steel bridge (C* on the map, Rockdale River Trail Phase F) spanning Georgia Highway 212. The steel bridge bears on concrete abutment walls at either end, was designed to meet the GDOT requirements for clearance, and features a covered section to mimic the historic barns at the Monastery. 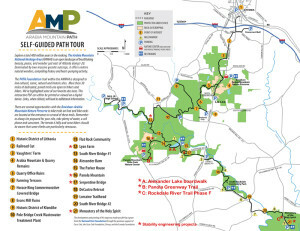 The Panola Greenway Trail connects the existing Arabia Mountain Trail and South River Trail to the Panola Mountain Conservation Park. The trail project consists of two 40-foot long simple span steel bridges with wood decking that cross creeks within the State Park, as well as the Panola Mountain Overlook (see #16 on the map), a 475-foot long wooden pedestrian boardwalk ending with an overlook platform and built-in seating. This structure was designed to hover over the granite rock substrate of the area to allow trail users to experience a unique view of Panola Mountain. The boardwalk design consists of 16-foot spans with 6″x6″ pressure treated posts anchored to concrete footers, and the edge of the pedestrian boardwalk contains a continuous 4×6 wooden curb. This trail also features the Alexander Lake Boardwalk (*A on the map), a beautiful 350-foot curved boardwalk over Alexander Lake. The boardwalk consists of wooden piles driven down to bedrock in the lake bottom, along with wood framing and cantilevered fishing platforms. Panola Greenway Trail won an Honorable Mention for the Natural Environment Project of the Year, from the American Society of Civil Engineers Georgia Chapter in 2013.